It's a wonderful Friday morning and I am super excited to be doing a guest post at one of my favorite blogs! (^.^) Which blog am I talking about? It's Wok With Ray...which is owned and written by Ray Gingco. Does that name ring a bell to you? Ray is a popular Filipino blogger who I admire a lot! He's one of those guys who enjoy cooking and do it so beautifully. A simple dish can turn into something very appealing with his food styling and photography skills. But that's not all! I admire him more for being able to maintain a wonderful blog while juggling an IT career, a catering business and a family life. I find him so AWESOME...and I'm really a big fan of him, I tell yah! 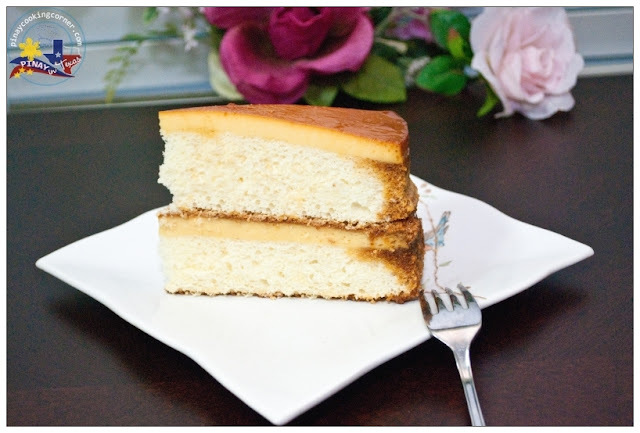 For my guest post, I am sharing my favorite Filipino Custard Cake. I've been reading Ray's blog for a year now, and I've noticed that he hasn't shared any baked treats yet so when he asked me if I could do a guest post for him, I thought it would be nice to share a cake with his readers for a change. Hope you'll all head over to Wok With Ray to join me and know more about this delicious upside down cake! While you're there, be sure to dig into Ray's archives! You'll surely be amazed with all the recipes you'll find! And please don't forget to subscribe to Ray's blog and follow him on Facebook and Twitter as well! 1. Slightly grease two 9" round baking pans. Combine caramel ingredients in a small saucepan. (Don't use a non-stick pan because sugar won't melt well on it.) Caramelize over low heat until sugar is all melted. Be patient. Do not stir at all. Just swirl the pan gently once some color begins to appear. Do not overcook the sugar or you will end with a bitter taste on your flan. Pour into prepared baking pans and set aside. 2. In a mixing bowl, gently whisk 6 egg yolks and 2 egg whites until well incorporated. Add evaporated milk and condensed milk and continue whisking until smooth and well combined. Do it gently so as not to agitate the mixture too much and add bubbles to the custard. Strain the mixture through a fine sieve (or cloth), and then pour into the baking pan with hardened caramel. Set aside. 3. In another bowl, mix flour, 1 cup sugar, baking powder and salt until well combined. 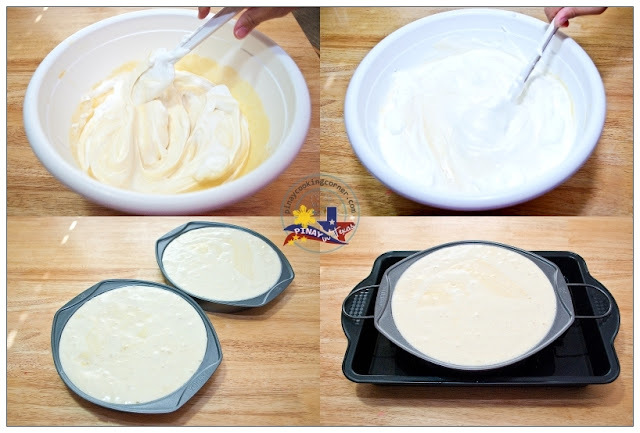 Make a well in the middle and add the egg yolks, milk, olive oil and vanilla. Whisk until smooth. In another bowl, combine 8 egg whites and cream of tartar. Using a mixer on low speed, mix until soft peaks begin to form. 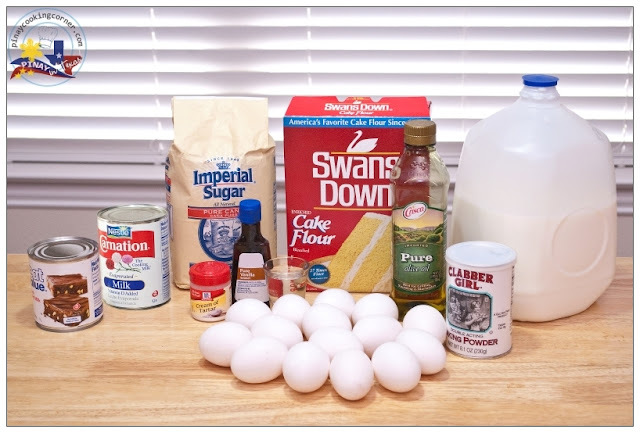 Gradually add the remaining 1/2 cup of sugar and continue mixing on high speed until the mixture forms stiff peaks. 4. Preheat oven to 350F. 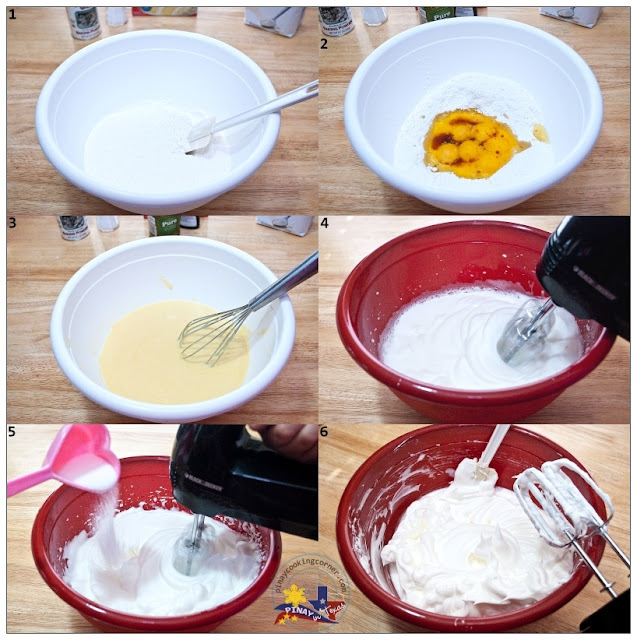 Fold in the meringue (egg white mixture) into the flour-yolk mixture until well combined. Pour mixture over the custard mixture in the baking pans. 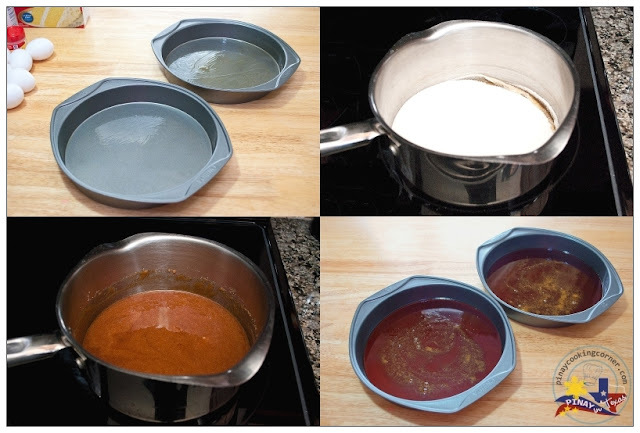 Pour about 4 cups of hot water into a roasting pan with rack then place the cake pans on top of the rack. Place the roasting pan in the middle rack of the oven and bake for about 1hour or until a toothpick inserted into the cake comes out clean. Start checking your cake after 50 minutes to be sure that you won't over bake. 5. Remove from oven and allow to completely cool down. Carefully invert the first cake onto a plate or cake stand, then carefully invert the second cake on top of the first cake. Slice and serve. The pleasure is mine, Ray! Thanks so much for having me over! Delicious custard cake Tina, I am heading over to Ray to blog. 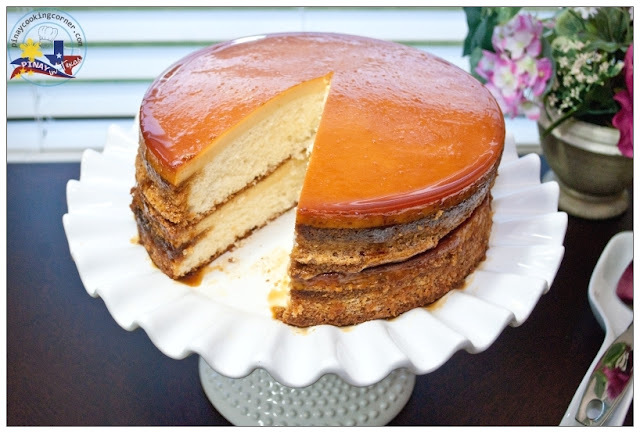 Tina, this is such a spectacular custard cake, a double whammy! This is one of my ever best favorite cakes. So delicious. Tina , your cake looks drool-worthy ! Love the yummy layers ! Tina, I'm headed over to check it out! Your cake looks amazing as always! Have a great week! Hi Tina, this cake is mouth watering. Love the texture, it look really good. 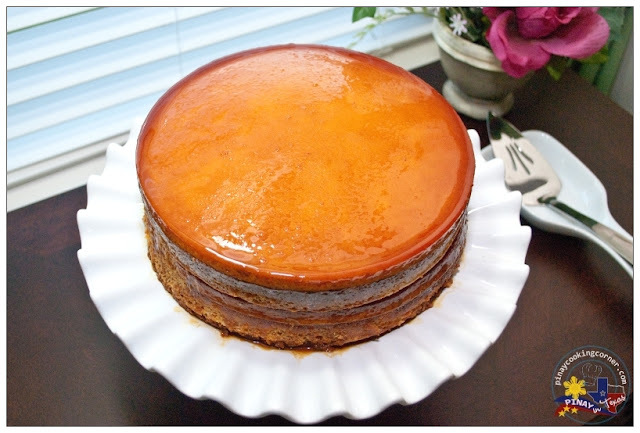 Lovely cake and I can see from the finishing that you have great skills for desserts. Btw, I posted your suman recipe on my blog about 1 hour ago. Thank you so so much Tina and appreciate your support in doing the guest post for me. The pleasure is mine, Nava! Heading over now! My ni's birthday is coming up and I think I just figured out dessert! Looks great! Amazing guest post! Tina this is an amazing custard cake! So luscious and delicious! I am going to check it out! Hehee I feel I'm a bit silly following you your guests first and it's all by coincidence. :D I'm enjoying your guest posts! ;) I love this custard cake - perfect for Ray's awesome blog! Thanks again Tina and for also leaving your comments. You are very welcome, Nava! Hi! Loving your blog. Just wanted to ask - do you invert the pan to cool the cake as you would a chiffon cake or do you just cool it in the pan without inverting it? Hi Maricel! Just allow it to completely cool down in the pan.